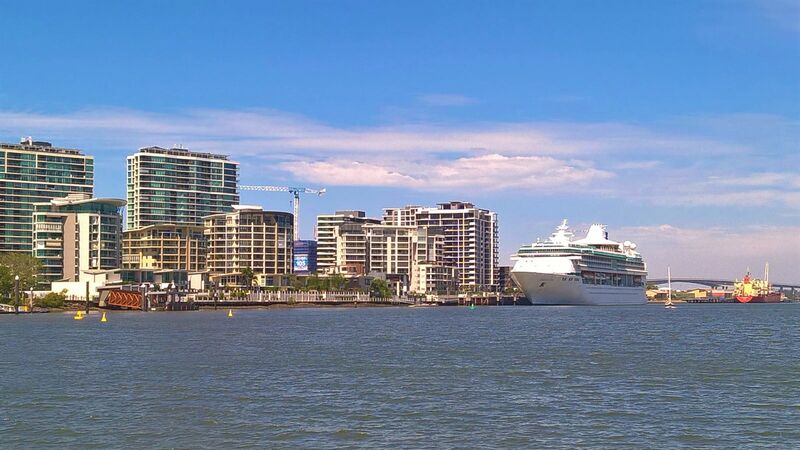 One of our favorite places to go on the weekend is to the nearby cruise ship terminal at Hamilton Port. It is little over a mere kilometer as the crow flies, but since it is across the river we have to catch the ferry, and get off 2 stops downriver. From the time of leaving our front door to arrival at the port, it is still only little more than a half hour journey – and we never even have to get into a car. 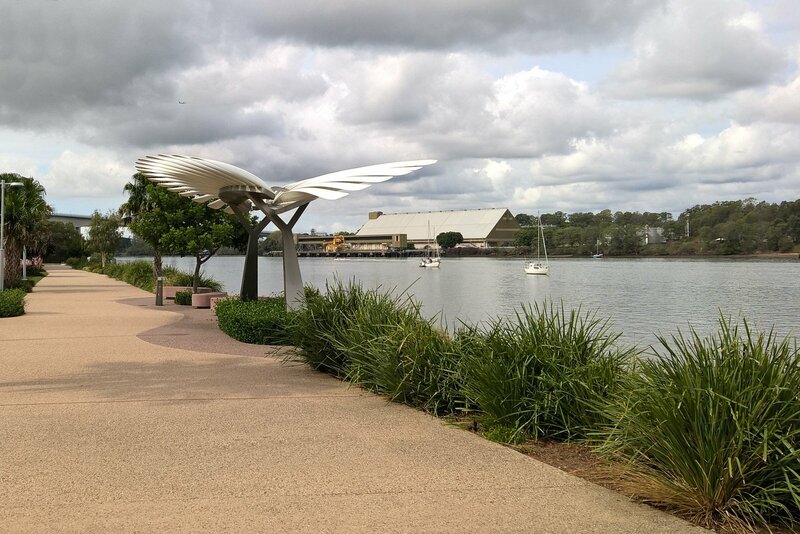 If you look carefully in the picture below you can see the Hamilton Portside ferry station (on the left), a short and enjoyable walk from the cruise terminal. We like to go over there and pretend that we are going on a cruise (sans the luggage, of course). If you are not taking a cruise from Portside why not take in a movie at the Portside Cinema and console yourself with some wine and popcorn while you are watching the movie? And a Choc-Top for dessert? 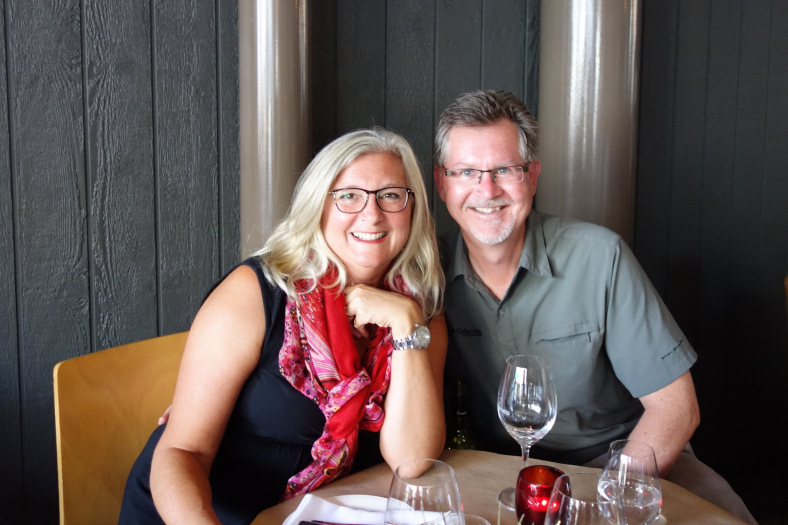 We haven’t been to that particular theatre yet, but we do like heading over to Portside to eat at “Fresh ‘N Wild seafood restaurant. Because it isn’t licensed we can bring our own bottle of wine to enjoy while enjoying the open air vibe of the restaurant – and of course, very fresh seafood – usually fish and chips for us. Wine glasses and water provided. 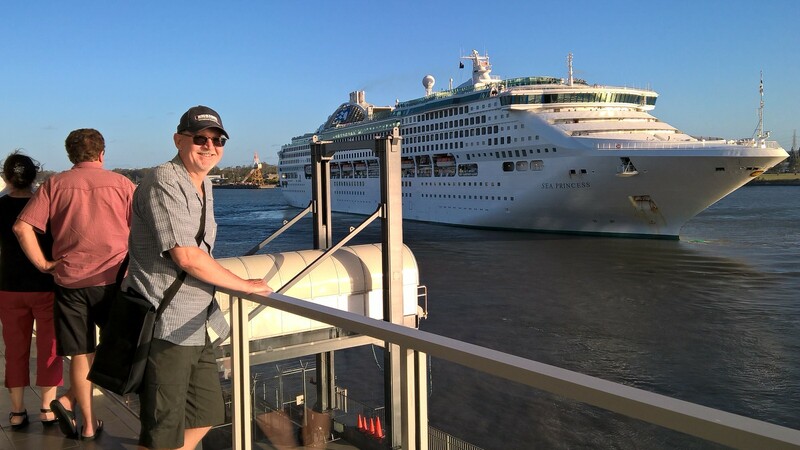 We always had hoped to take a cruise from this port while we were here and although it isn’t likely to happen now, we enjoy heading over to the port when a cruise ship is docked. 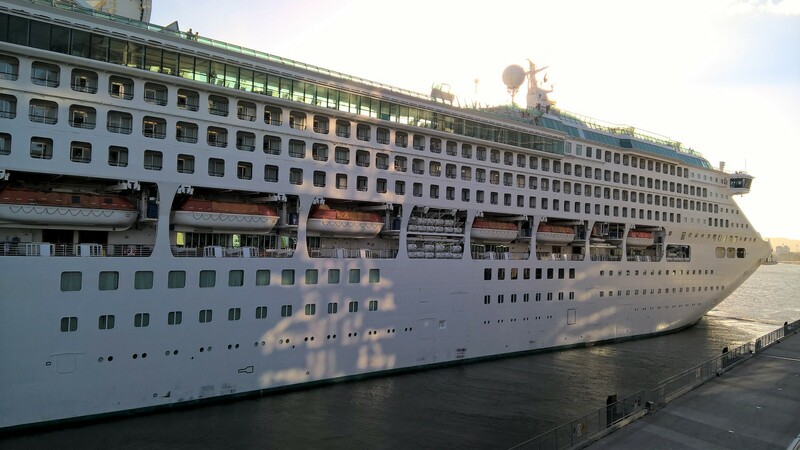 We time it so that we can watch the ship leave the port. 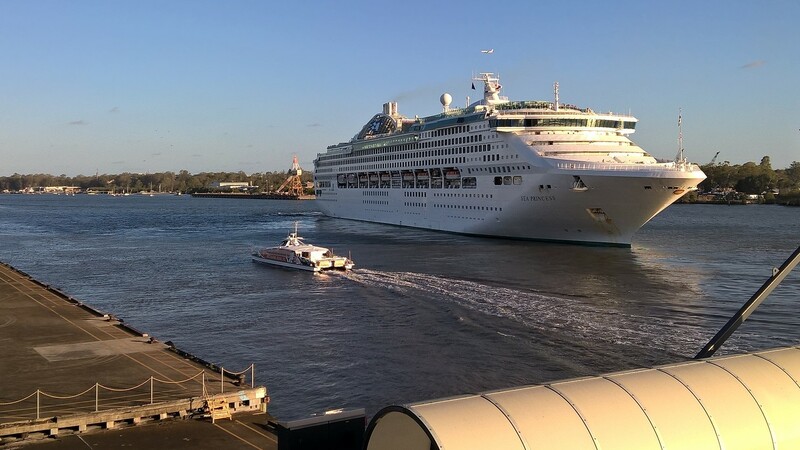 It is fun to watch, from the observation tower, as the little tugboat turn this mighty ship around in the middle of the river. Instead of Planes, Trains, and Automobiles, we have Ferry Boat, Cruise Ship, and Plane. This is the down-river end of the line for the City Cat Ferry. There isn’t too much here, but it is a pretty little area and we like to check it out every once in a while. 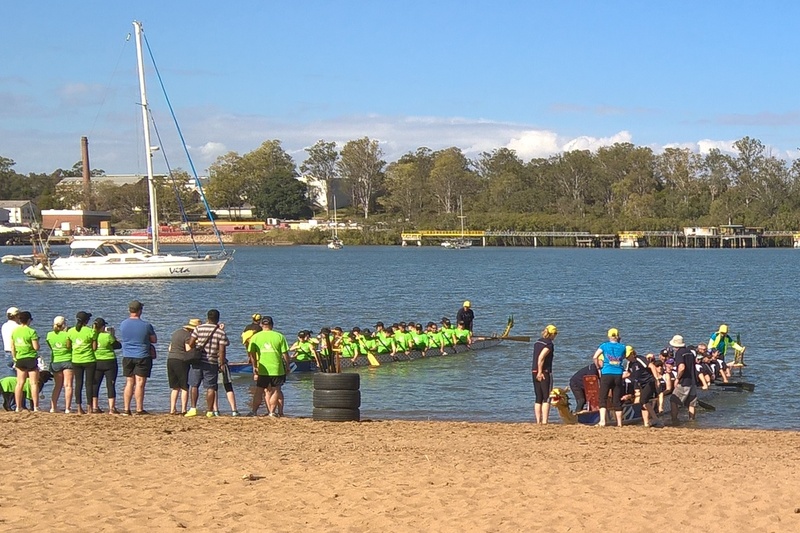 Sometimes we come across something interesting – such as the Dragon Boat racing event. Although distances for this international sport are set up to 2000 m, this one was short 200 m lengths. They barely get started before they stop. There is a small beach area (although you really would not want to swim in the water here.) Notice the dragon head on the 20 paddler boats. While there, why not take in some refreshment. Again. The water area between Hamilton Northshore and Portside is currently populated by warehouses. But these are being torn down and city development plans promise that in the next decade this area will be built up with shops, housing, and park, as well as some commercial. The shops will be an attractive addition to visitors going on a cruise. 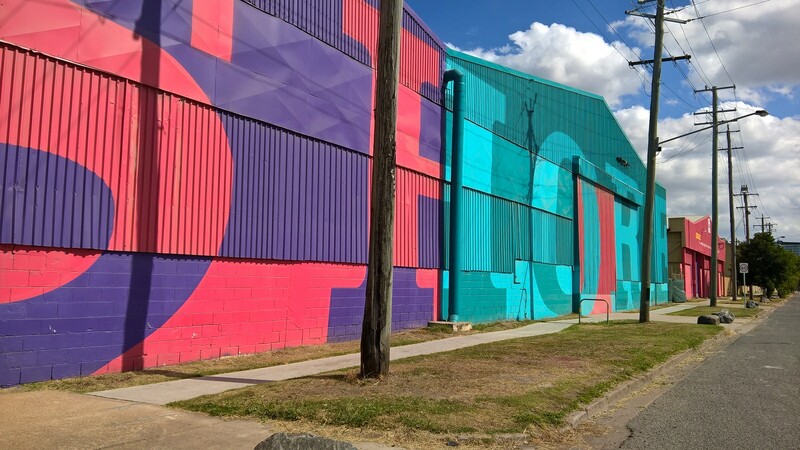 We walk by some brightly painted warehouses, which provides some relief in this industrial area. 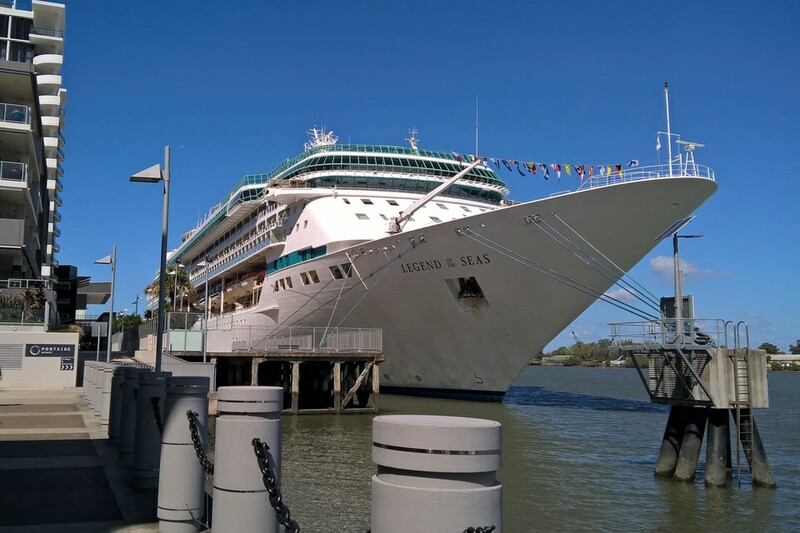 Here are some final pics of us as we explore by the river and dream about cruising. (The first two were from early days here and the last two are recent.) From us to you a big Bon Voyage, wherever you are journeying today. Well, enough wandering and wondering for this day. There is always tomorrow. 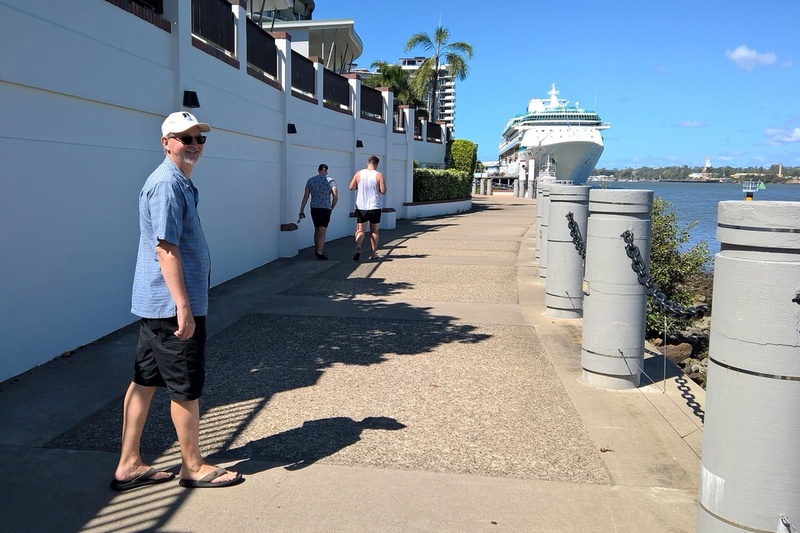 This entry was posted in Our Brisbane Life and tagged Cruiseships, Cruising, Hamilton Northshore, Hamilton Portside Cruise Terminal. Bookmark the permalink. 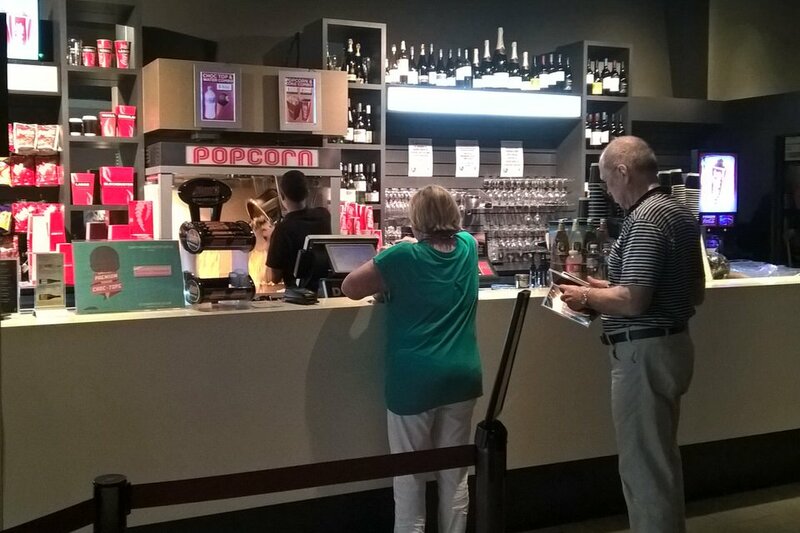 You had me at popcorn and wine at a movie! Then you topped it off with a choc top. I love the new hairstyle!